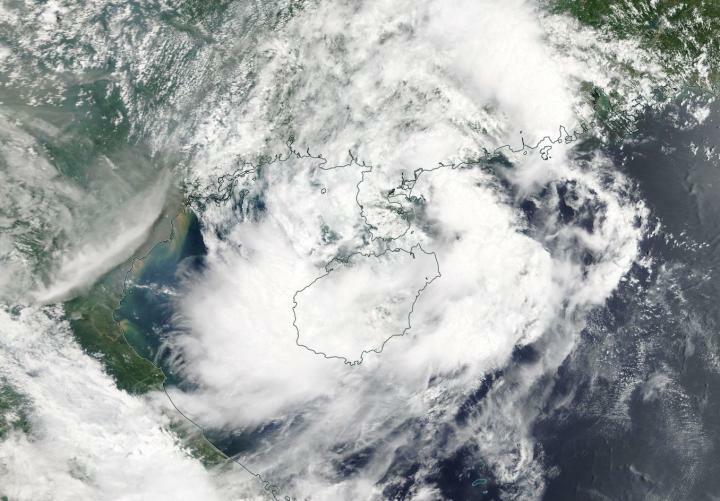 NASA's Terra satellite found Tropical Storm Son-Tinh continuing to drop rain over Hainan Island and mainland China. The Moderate Resolution Imaging Spectroradiometer or MODIS instrument aboard NASA's Aqua satellite caught a visible light image of Tropical Storm Son-Tinh on July 23. The MODIS image showed an elongated storm with strongest storms being pushed east of the low-level center because of vertical wind shear. There is also a weak banding of thunderstorms wrapping from the northern quadrant into the eastern quadrant of the storm. At 11 a.m. EDT (1500 UTC) the Joint Typhoon Warning Center or JTWC noted that Tropical Son-Tinh had maximum sustained winds near 35 knots (40 mph/62 kph). It was located near 21.0 degrees north latitude and 109.9 degrees east longitude, about 230 nautical miles east of Hanoi, Vietnam. The center of the storm is actually located over land on the Leizhou Peninsula, China, just north of Hainan Island. Son-Tinh has tracked northward at 4 knots (4.6 mph/7.4 kph). The JTWC noted that the system has begun to recurve northward and appears to have entered a quasi-stationary state. The JTWC forecast calls for the storm to move north further into mainland China and dissipate by July 25.